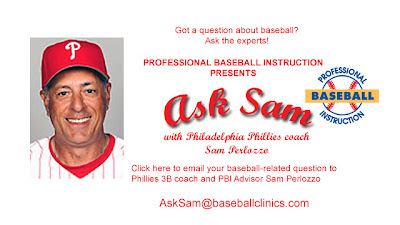 Philadelphia Phillies 1B coach and PBI advisor Sam Perlozzo periodically answers your baseball-related questions. Email Sam directly – AskSam@baseballclinics.com. Here’s the latest from the “Ask Sam” mail bag. Q: Sam – I play baseball for my high school team, and I plan on playing summer ball this year as well. In the past, I haven’t done much in the fall, though I know I probably should. I am very involved in the weight room and training for baseball and very involved on working on my mechanics and my swing. I am a shortstop/pitcher but I like shortstop better. Is there any period of time where a baseball player should shut down his body for a while or give it a rest. Like stop working out, throwing, batting, and etc… If so please tell me the best time period so to do so. Thank you, Nick. A: Nick – Most professional baseball players go through a grueling 7 or more months of practicing or playing during the baseball season and at the end of that period need some time off to let the body heal and rest up. Even at your age I would say, depending on how much and how hard you work out, that you’ll need some down time. Professionals usually take about a month off after the season and then gradually start working into their baseball shape. What you would want to do is to gradually build up the workouts and intensity as the winter goes along and then in January kick it into a higher gear to prep for the start of spring ball. Any weight training would gradually increase also. Throwing is always good to keep on pace as you never want your muscles to shorten up for too long a periond of time. Mechanics are always good to do on a regular basis also. The only difference would be that your days of work would start out maybe 3 to 4 times a week and gradually increase as the nearing of the baseball season comes closer. Listen to your body, and it will tell you when to slow down and when to speed up. Hope this helps. Best of luck this season. to how he sits from an outside rating perspective. Can you recommend a good, ethical group for us to look at? Any help would be appreciated. A: Jeff – There are some organizations that actually put your son in a 5 day or so program where they evaluate your son by working him out in that period of time and actually send film to colleges that they feel your son can compete at. They grade him out, send recomendations to colleges that they know need players for their programs. So, if your goal is to get your son placed in a collegiate program, these are pretty good avenues to do so. My son went to one in the Baltimore area, and actually I feldt it was a pretty good way to go. There would be a fee to attend but his skills would be showcased to a great many schools. I know Doug and the staff at Professional Baseball Instruction work closely with quite a number of schools and they offer a college video service, too. If I remember the name of the one in Baltimore in the next few days, I will forward it along to you. Best of luck to your son. Thanks to everyone for all the great questions. It’s great to have baseball back after the long winter. Send your questions to me via email – AskSam@baseballclinics.com.